This is my favourite single issue of all time. Occasionally people will ask what my favourite comic is, and I'll say it's probably this one. But I'm going to take a stand and declare, officially, today, that Animal Man v.1, #5, is my favourite comic of all time. 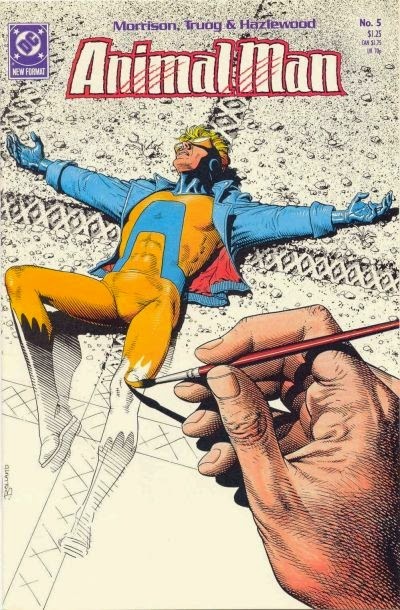 I started reading Animal Man when he got his own series because his origin story showed up in a DC Blue Ribbon Digest that I owned when I was young, and I loved it. I had no idea who Grant Morrison was, and I was certainly not ready for the dark, yet somehow cartoon-y (thanks, Chas Truog) adventures that were to come. The first four issues are brutal and exciting, and I'll admit that they, in many ways, pushed me toward vegetarianism (though it took until I read the liner notes of Moby's "Everything is Wrong" before I took the plunge). I don't know really what to say about this issue. It finally made me realize what comics are capable of. It made every Wile E. Coyote cartoon I've ever watched in the following 24 years horribly tragic. It started me on a semi-obsessive mission to read everything Morrison ever wrote. I'm pretty close, I think. Animal Man himself doesn't really do much in this comic. And I think that's one of the many revelations that this issue showcased for me. To this point, I'd been reading mainly Marvel stuff, Claremont's X-Men, Roger Stern's Avengers, comics that, while good, were always centered around some grand action moment featuring the main characters. Animal Man flies into the middle of a story, and doesn't really understand what happens, and that's the end. Crafty Coyote is the star. Or maybe the trucker. Who, I'll note, was the first queer character I'd ever read in a comic book. It's the first metatextual comic I ever read, or at least the first one that I noticed was metatextual. Truog's art, as I mentioned, is quite cartoony. One of the wonderful things about the series as a whole is that it is very, and I mean this as a compliment, simple art, very clean lines and colours, but it combines that aesthetic with a Vertigo-esque sensibility as far as the violence and strangeness of superheroic life. This makes for a really hallucinatory quality in the stories that meshes so very, very well with the eventual climax of Morrison's run. I know, not a very critical look. I think this is a perfect comic. What more can I say?